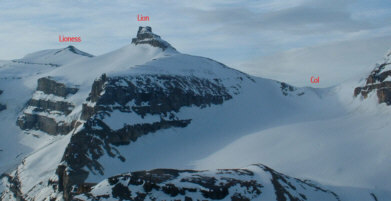 Location:Located just East of Mount Cline and visible from most of the summits to the East. Rock: Too far to walk for rock climbing! Alpine: Park at Thompson creek and try and follow trails along the right side of creek to the Lion/Cline col. (GR 223694) 4 – 6 hours from car. From the Cline/Lion col follow the easy ridge to either summit. Avoid the cliffs near the top of Lion by traversing around to the right. 1 – 2 hours from the col. No difficulties. Resolute from the North, the opposite side of the col from the ascent route.